Conservative leader David Cameron has pledged to reform, replace or scrap the Human Rights Act if he is elected. His comments follow a court decision to allow nine Afghans who hijacked a plane to Britain to claim asylum in the UK. Home Secretary John Reid has said the government will try to overturn the "inexplicable" High Court ruling. Tony Blair said the move was an "abuse of common sense" and Downing Street has left open the question of whether human rights laws need amending. "There is a need to reassure the public that common sense logic should be right through the legal system, so there is the need, if necessary, to rebalance the system so that happens," the Number 10 spokesman said. But Mr Cameron told the Sun newspaper the government had been "complacent" in failing to take on board the Act it introduced in 1998 was undermining the UK's ability to deal with foreign criminals. The most recent Conservative general election manifesto contained a pledge to reform or, failing that, scrap the Act. The Tory leader said it was now "close to impossible" to deport foreign nationals who posed a threat to the UK. "The government's attitude has been complacent. It refuses to recognise that the problem is compounded by the interpretation of the European Convention and the passage of the Government's own Human Rights Act." 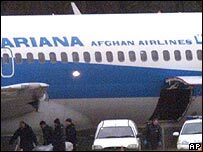 The nine Afghans hijacked a Boeing 727 on an internal flight in Afghanistan in February 2000 and forced crew to fly to Stansted in Essex. They were fleeing the Taleban regime since overthrown in the US-led invasion.